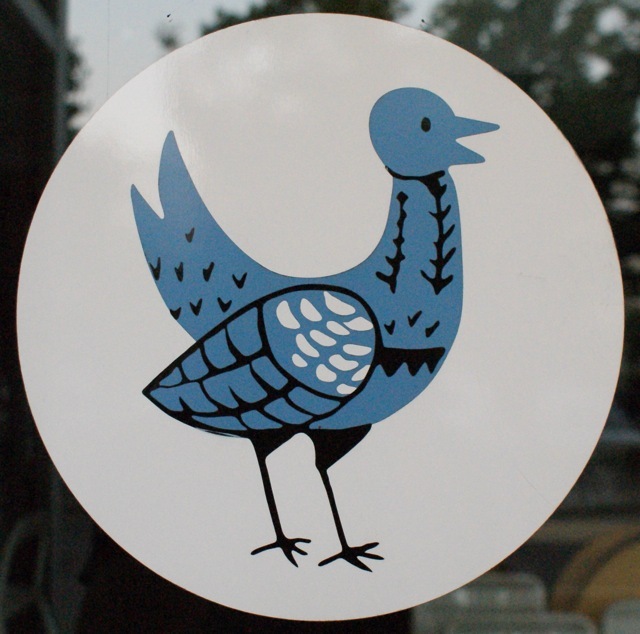 La Farm is one of the Triangle’s premier bakeries, and one of only a very few that make good artisanal loaves of bread (Loaf, Rue Cler’s Bakery, Guglhupf, and Chicken Bridge Bakery are a few others that come to mind). So this is one of the best places to come – and folks throughout the Triangle do – to get a good baguette, a loaf of crusty ciabatta, or a croissant. Or, of course, for one of many delightful treats. Despite the linguistically hybridized name, this is a thoroughly French boulangerie. And, though it’s set in a typical Cary strip mall (seemingly far from everything), it actually manages to evoke that small Parisian cafe feel. It’s charming inside, with delicious looking baked goods all around, and a recently expanded cafe section that spills over onto the narrow sidewalk out front. Even if the bread wasn’t worth the trip, you’d want to come back. But enough about the bread for now. The cafe is tempting in its own right, with breakfast and light lunch/dinner fare on offer. The menu features a number of sandwiches, salads, and egg dishes – nothing unexpected really, but solid choices, and a superb value for most selections. You can get a large sandwich with a side of chips for just $6.95, and kids meals are just $2.25. I’ve had several of the sandwiches, and, it must be said, while the bread is great, the sandwiches are merely average. I recently had one with smoked turkey/homemade creamy slaw/peach-chipotle bbq sauce (one of this summer’s special menu additions) that was rather boring. There just wasn’t much flavor. My wife was similarly underwhelmed with her “Mediterraneo” (fresh mozzeralla/roasted tomatoes/basil/balsamic vinaigrette (+added chicken, $1.95) on foccacia). Sandwiches are served with a side of homemade hearth-baked potato chips, which are crunchy but a bit lifeless; they are greatly improved by dipping in the accompanying buttermilk ranch dressing. I’ve yet to try the egg-based or breakfast dishes, but many of them sound appealing. Then again, if I were here for breakfast, I might just choose a buttery croissant or one of their outstanding white chocolate-cinnamon scones (I’m not a fan of the triple berry variety). Speaking of white chocolate, everyone seems to love La Farm’s white chocolate mini-baguette, and I am no exception. 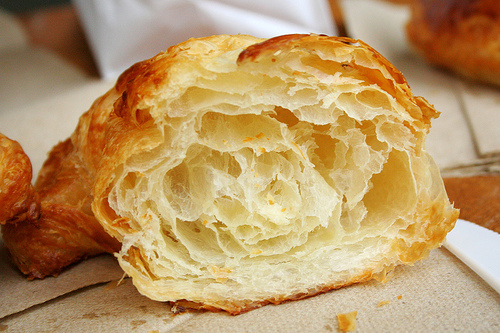 So even if you’re a little disappointed by your meal, pick up a pastry or loaf to go, and you won’t be let down. Note that La Farm also sells at the Raleigh farmer’s market on the weekends. If you love eating, as I do, you’ve got to love Durham! There’s so much good food to be had in the Bull City, from Mexican to burgers to fine dining, and, more recently, to excellent baked goods. First there was Scratch, which opened last year, and operated without peer in the Triangle until the recent opening of Daisy Cakes, just a few short blocks away! While not entirely new to the scene – Daisy Cakes operated out of a sleek airstream trailer over the past few years – their new cafe has allowed the business to really blossom. Situated on Foster St. near the farmer’s market, the place was slam packed on a recent Saturday morning. The interior of the restaurant is quite narrow, with very limited seating. Lines form quickly, and finding a table is tricky, although there are a few scattered just outside the front door. The space features whitewashed brick walls and is equally as charming as Scratch: where the latter is subtly sleek, Daisy Cakes is undeniably cute. Like at Scratch, it’s really hard to decide what to order at Daisy Cakes. They have a bountiful array of pastry and sweet choices, sure, but also a tempting menu of savory sandwiches and light entrees. The menu is ambitious, but perhaps not quite as creative as Scratch’s. I went with the carnitas hash ($8.95) plus a strawberry “pop’t art” ($1.95). My wife chose the day’s omelette (roasted tomato, spinach, cheese, $7.50, served with toast and fruit) and a housemade chai tea ($3.25). My carnitas hash was a substantial dish, served with two unexpected slices of toast. It was a bit underseasoned, and I would have liked some more onion in with the potatoes, but it came with two nice fried eggs on top and was plenty tasty overall. The “pop’t art” was outstanding: a circular slightly sweet crust filled with just the right amount of bright strawberry jam. My wife’s omelette was also good, if not great. But the chai tea she ordered was incredible – served in a very funky mug with a sprinkling of cocoa powder on top, it was spicy, creamy, and just perfect. I also got to try some of their well-regarded almond cream brioche. It was served as a massive thick slice with a little fruit on the side. It was very good, moist and decadent, but I probably wouldn’t order it myself. If you’re heading to Durham and can’t decide between Scratch or Daisy Cakes, you could just flip a coin. For me, until I try more of the Daisy Cakes menu, including their renowned cupcakes, I’d give the slight edge to Scratch. But at either place, you’re sure to get lovingly crafted food in a super charming setting. As for me, I’m eager to go back for more of both. As much as we love Durham, it’s sure to be sooner rather than later! 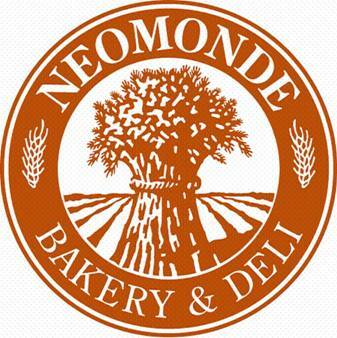 Despite being situated in an obscure, hidden location near the NC state fair grounds, Neo Monde has a steady and devoted following. The Mediterranean deli is a favorite of many, including me, for good reason. The food is consistently delicious, it’s inexpensive, and the staff is supremely friendly. If that weren’t enough to bring you in, there’s also a bakery and small market/grocery area where you can pick up some wonderful pita bread or a Turkish olive oil, for instance. Since their menu is relatively large, my favorite way to approach a Neo Monde meal is to get the pick-4 sampler ($7.99). This enables you to try a variety of their scrumptious items displayed behind the glass case. Standouts for me are definitely the hummus and baba ghannouj, both of which are the best that I’ve had. The hummus in particular is creamy and silky smooth. I almost always get some of their excellent chicken salad, which features raisins and cinnamon. And I can’t bypass the terrific mjadarah (rice/lentils with caramelized onions). Other solid choices, if a little less fabulous than the above, include a roasted potato salad with mint, fatoush, tabouli, or stuffed grape leaves. There are also kabobs and usually one or two other hot entrees to choose from. You carry your tray along with you, cafeteria-style, so you can’t miss the large dessert case as well. Neo Monde’s baklava is as good as I’ve had anywhere. I haven’t tried many of the other desserts or pastries, but I don’t really feel the need to. Beware, though, as one piece of the baklava is deceptively filling. If you go with the sampler, pita bread (your choice of white or wheat) comes with it. All items are also for sale by the pound as well. After you pay, you can take a seat inside or dine on their pleasant, if unscenic, patio. Either way, you’re bound to be back soon. As a side note, Neo Monde also does a great job with catering. Ordering online is easy, and the staff is gracious and helpful, setting up cards that describe each dish and going out of their way to make your event enjoyable. They’re thoughtful to place vegetarian and meat dishes apart, and kind enough to follow up with you to see how everything went. Durham has celebrated restaurants, to be sure, some of which get more attention than others. You hear about places like Magnolia Grill and Watts Grocery, and, lately, Scratch Bakery and Bull City Burger & Brewery. 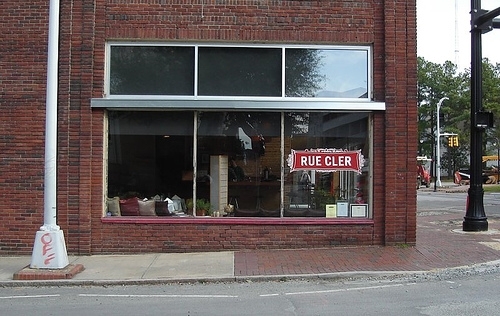 And, though it is certainly not hidden, Rue Cler in downtown Durham is absolutely a gem, and indeed deserves more attention as one of the top few restaurants in the entire Triangle. Occupying an unassuming corner in downtown, Rue Cler is a fancy restaurant without a hint of pretentiousness. The charming space features some closely packed small tables (in the European style) and a blonde slat-wood wall adorned with beautifully printed maps of the wine regions of France. It’s a lively spot that feels as though it could thrive in the most cosmopolitan of cities. Without even mentioning the food, the overall vibe and ambience are so nice that you’ll want return. Rue Cler does a wonderful brunch (featuring excellent crepes and beignets), and an even better dinner. To top it off, a small bakery/café is attached next door where you can pick up a pastry, a loaf of bread, or a light lunch. They’ll also sell you some excellent pizza dough if you ask. The bakery is one of the best in the Triangle, in my opinion, and is worth seeking out on its own. For dinner, Rue Cler offers a prix fixe menu (3-course, $30) along with a small selection of a la carte entrees and sides. It’s a French restaurant, so the usual suspects are there – steak frites, coq au vin, pommes dauphinois – but the prix fixe menu, which changes frequently, is hard to bypass on account of its array of tempting options. On a recent Saturday evening, my wife and I both started with the frisee salad. Featuring candied pecans, dried cherries, and a honey vinaigrette, it was delicious and rather sweet, an effect that was not quite offset by some crumbled mild bleu cheese. Still, it was a light and refreshing start to the meal. For seconds, my wife opted for the shrimp crepe (spinach, leek, sauce mornay), and I went with the beef/pork/gruyere dumplings with browned butter. Both were very good, but the crepe was augmented a little too much of the creamy, thick sauce. My dumplings were essentially pierogies, blackened on one side, and filled with a meat mixture that approximated breakfast sausage in the best possible way. The sage browned butter only added to the decadence and richness, but the dish was perfectly portioned, and so good that I was reluctant to share. Lastly, for our third course, my wife chose the grilled leg of lamb with sauce Robert, herbed spaetzle, and caramelized onions, and I selected the B-line snapper with eggplant/zucchini/field pea ragout and lemon-herb crema. The lamb was nicely cooked and carved, and boasted a very strong wine-mustard flavor. This made the subtle herbed spaetzle, which was served as a substantial amount, a necessary complement. My fish dish was just exquisite. It went beautifully and delicately with the vegetables and thin sauce, and didn’t really need the crema (which, to my surprise, resembled a small dollop of lightly whipped cream that broke down immediately on contact). Although both entrees were good, the fish dish, being more well-rounded, was the more exceptional of the two. I savored each and every bite. To sum it up, the three courses together made up one of the best meals I’ve eaten in the Triangle. Everything was expertly cooked, seasoned, and portioned. The plating was simple but elegant enough. I don’t usually care about service either way, but I must say that in our case it too was perfect. The pacing of the meal was just right, and the waitress was unobtrusive, efficient, and gracious. It’s rare that a restaurant hits all of the right points and leaves you thrilled, but our dinner at Rue Cler was almost flawless. I’m eager to return. When I first wrote about Scratch Bakery in Durham shortly after its opening, I mentioned the great food, but I didn’t love everything I tried (see previous post). After going back this weekend, I have changed my mind. The place is awesome, the food is fantastic, and we are lucky to have this place so close. If I could, I would go there every day. It was bustling this weekend – there wasn’t a seat to be found – and Phoebe and co. had seemingly unplugged all the stoppers: there was a dazzling array of goodies to choose from. Buttermilk sausage biscuits, Spanish potato-onion quesadilla, walnut coffee cake muffins, ricotta-date-candied orange crostadas, ricotta-lemon-honey mousse tarts, and on and on. These, of course, in addition to some of the usual favorites: doughnut muffins, chocolate sea-salt tarts, and a huge selection of cakes and pies. Restraint when ordering was exceedingly difficult. The sausage biscuit ($3) was excellent, and my wife’s “SOS” (a giant piece of toasted rustic bread covered with creamy collards, bacon, and a poached egg, $7.50) was even better. A hot chocolate was creamy, foamy, and exquisite. I took home a couple of half-priced day-old goodies: a sweet-potato/bacon crostada (which was surprisingly bland) and a nice walnut coffee cake muffin. And we couldn’t resist a chocolate sea-salt tart to go either. One bite took me back to a small craft fair in Raleigh probably five years ago, when Scratch was selling out of coolers under a small tent. I had the same treat then, and experienced the same reaction: near perfect, and I just want more! Phoebe Lawless is the baker behind Scratch, a Durham start-up that is garnering widespread attention (see recent mention and recipe in Bon Appetit magazine). And deservedly so, as she creates some amazing pies, pastries, and treats. Last week, Lawless opened her highly anticipated retail location on a quiet, leafy side street in downtown Durham. It’s an immensely charming space, with a clean, modern feel. The glass store-front, high ceilings, and exposed brick walls give an airy, casual ambience. The tables are heavily lacquered turquoise wood, the floor is a nice smooth tile, and the remaining walls are brightly colored without being overbearing. A smattering of outdoor tables lends a nice European café feel and makes you want to linger. Back inside, a glass-fronted counter showcases all manner of tempting creations, with little chalkboard signs describing the offerings and their prices. A recent visit confounded with choices like local lamb & rice empanada, pesto & farmers cheese stromboli, zucchini crostata, some kind of bruschetta involving a giant wedge of cheese, and, of course, donut muffins – dense, cake-like muffins rolled in immense quantities of sugar. But that was not all. As we sat eating, more goodies arrived, notably slices of pizza, with topping like guanciale/garlic scape/asiago or new potato/broccoli/ricotta. Further down the counter, a glass case featured more of the sweeter creations, such as a crumb cake, a blueberry pie, and some cheesecake squares, among others. Still further down the counter, another glass case featured some vegetable side dishes and cold salad items, such that you could really put together a nice lunch. Without exception, everything looked beautifully crafted and delicious. 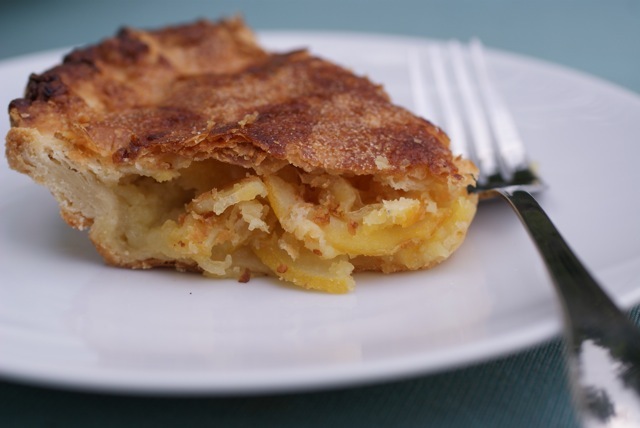 Where Scratch really excels, I think, is with the execution of its crusts and crostatas. But it’s not just the extraordinary crusts, it’s the fillings too. The zucchini/sautéed onion/cheese crostata we tried was fabulous. In the past, I’ve had a butternut squash/chorizo empanada and a dark chocolate/sea salt pie that were among the best pastries I’ve ever eaten. By constrast, the pesto stromboli was definitely yummy, but I found the dough to be too soft and fluffy-pillow like, and I felt there was not enough of the filling. A simple sticky bun was nicely nuanced but a touch dry. And the lemon shaker pie I tried, while beautifully executed, was difficult to eat. I felt it needed a bit more sugar to counter the dominating taste of the lemon slices. In the end, Scratch is a terrific addition to the Triangle dining scene. It’s the kind of place you’d expect to find in a much bigger city. The bakery fosters a wonderful link to the area’s farmers by featuring local organic ingredients almost exclusively. To be sure, the top-notch ingredients and excellent craftsmanship are reflected in the bakery’s prices – at $4 for slice of pizza, $5 for a small crostata or slice of pie, or $6 for a (fairly large) empanada, you can run up a big bill quickly. But the quality of the food is well worth it. When we were there the place was packed, and I hope it stays that way.